I couldn’t be happier to share something a little new this week at The Happiness Corner. I’m a part of a Hungry Hearts Holiday blog hop where we’re sharing a recipe for each other upcoming holidays (Thanksgiving is up first, then Christmas, then New Years). 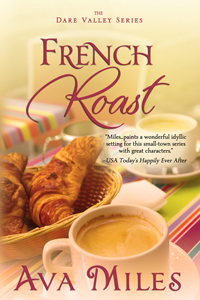 As you know, I used to be a chef, still love to eat and cook, and sometimes write about it (can we say FRENCH ROAST and THE HOLIDAY SERENADE?). Here’s what it’s all about. There’s even a grand prize, so keep reading so you can enter. After that, I’m going to tell you why the Thanksgiving recipe I chose makes me so happy. There’s a really special memory associated with it that I’ve never shared before. CELEBRATE FALL with mouthwatering Thanksgiving recipes and delicious EXCERPTS from today’s hottest food-loving ROMANCE writers! Fill out the Rafflecopter form on each author’s site to enter the Grand PRIZE Giveaway: a Harry & David Tower of TREATS! In addition to the Grand Prize, two SWAG packs will be given away on each day of the hop. Visit Amanda Usen’s blog (http://amandausen.wordpress.com/) each day for more FALL GLEE. So, my favorite Thanksgiving recipe is Toffee-Crusted Apple Pie. Our friend, Rita Patocka, made this pie for us when I was probably eight or nine years old, and since then, I don’t like apple pie any other way. It only has a bottom crust, and the top is all crispy and toffee-like, creating a unique texture. I usually make this pie as one of our many pies for Thanksgiving (with six kids in my family plus in-laws and kids, we have quite a crew). This pie holds a special memory for me. When I was in graduate school, I was part of an international program at Notre Dame University in which there were only three Americans. I lived with people from all over the world during that time, and part of the program was to host a meal to share their culture with everyone else (I ate some great food that year). Well, I picked Thanksgiving. What could be more American than that? No one in my program could go home since it was too expensive to travel to places like Egypt or Cambodia for the holiday. My big family drove the ten hours to come and spend it with us. That’s my five brothers and sisters and parents. They brought the party to us. My mom brought food, and I cooked for three days at a professor’s house, our host. Sharing our American Thanksgiving tradition with people from other countries was truly special because I saw the holiday in a different way. Not many countries have something like this. This is a holiday of gratitude, and you know how I feel about that. It’s the pathway to happiness. Everyone loved me talking about how Thanksgiving started (yes, I talked about the Pilgrims and the Native Americans), but more importantly, I talked about what it means for me. That this holiday is about the three Fs: food, family, and football. A couple sisters would add Black Friday shopping, but I’m not the dire-hard they are. Every year at our holiday table, we all take turns telling each other what we’re grateful for this past year. When I sit down this year, I’m going to have a lot to say: leaving an old career to become a full-time writer, connecting with so many readers and writers, being blessed to have four books out so far this year (five in December), and just the knowledge that I am serving my highest purpose here on earth. What could make you happier? Well, a hunky hero, of course. J But I digress. This Thanksgiving, I hope you give this recipe a try, but more importantly, my wish for you is a place in the Happiness Corner, filled with gratitude, wherever that is for you. And now, here’s the awesome recipe. Enjoy! 1 crust for the bottom (you can buy a prepared crust or make one from scratch). Here’s our family recipe. Mix until incorporated (not too much, but just until it comes together). Then roll out onto a floured surface into a circle. Lay into the pie plate and flute the edges by pinching the dough on the top and sides between your two index fingers. 6-7 cups thinly sliced, peeled apples (enough to fill a pie plate and be heaping)—I use Granny Smith because I like a tart pie, but you can use a combination of apple types for more balance. Experiment. See what you like. That’s my favorite part of cooking. Mix all the ingredients in a bowl until flour is incorporated, and the mixture is thickened. Place in the uncooked crust. 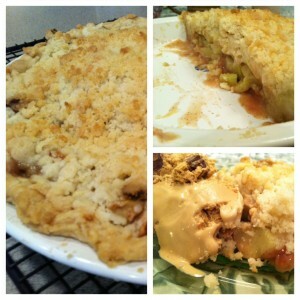 Mix with a pastry wheel or a fork until crumbly and place on the top of the apples. Bake at 425 degrees for 15 minutes, and then lower the temperature to 350 degrees and bake for another 35-40 minutes. Check the top of the pie, and if browning too much toward the end, cover with aluminum foil. You will know the pie is done when it bubbles. I serve with vanilla ice cream or this new fabulous sea salt caramel type I can get at our local Giant. See what works best, but most of all, have fun! Enter our giveaway for a chance to win an awesome HARRY & DAVID gift basket! What a great giveaway for the holidays! And the recipe looks great. Always useful to get new things to try during the holiday season. Thanks for sharing!! Cranberry sherbet, homemade by me and handed down from my grandmother. The receipe starts with one bottle of 7 oz of ginger ale; that alone tells you how old the receipe is!! I like stuffing, but for the last few years we’ve had Turducken with a Seafood Jambalaya stuffing. Yummy! My favorite Thanksgiving dish is the dressing. I just got hungry typing that. My favorite is the turkey stuffing. I love the stuffing. For dessert – Cranberry Swirl Cake. This looks so delish…thanks for sharing. I’m a stuffing girl. I make mom’s chestnut stuffing every year. Though my family is all about the pumpkin pie! Cheers! Wow this sounds amazing!! This blog tour is going to cause some major weight gain…..sigh. My favorites at Thanksgiving or any holiday really are the desserts and this recipe will give us a nice new addition. I love the green bean casserole! And my mom’s nutty fruit salad.